Celebrate! The 50 Year Anniversary – The Embroiderers' Guild, Queensland Inc. The creation of bunting which festooned the Guild rooms for the entirety of 2018. Additional lengths were made so that it could be mailed or hand delivered to affiliate branches. Each member group and affiliate branch hosted a birthday party at the start of 2018 to celebrate the Guild’s inception. A formal High Tea marking the anniversary was held in the then recently renovated Brisbane City Council Chambers with approximately 150 attendees. The Celebrate! Exhibition was held in June 2018. A tablecloth capturing signatures of all people attending the High Tea or the Celebrate! Exhibition was organised. A Christmas Party to farewell the Celebratory Year. 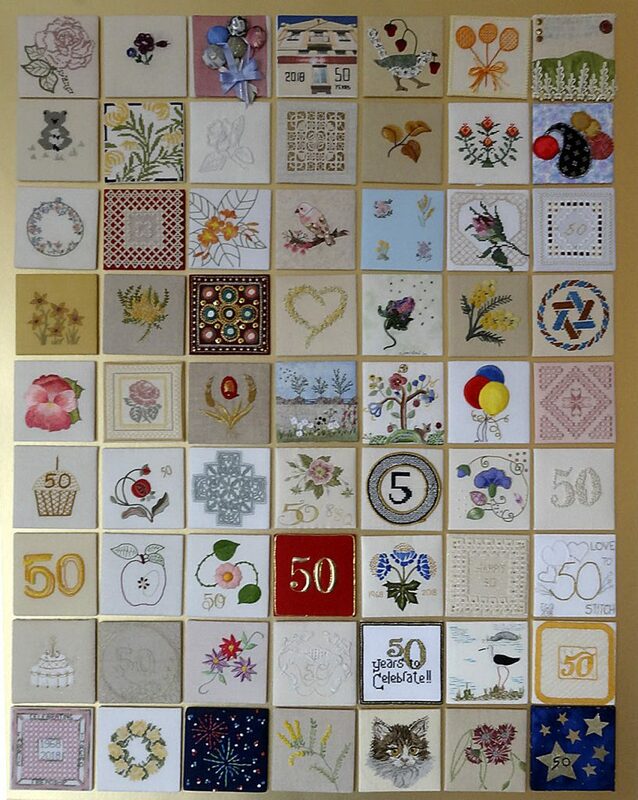 A lasting reminder of the Anniversary has been the creation of The Celebrate Embroidery Panels which all members of the Guild were invited to contribute to. 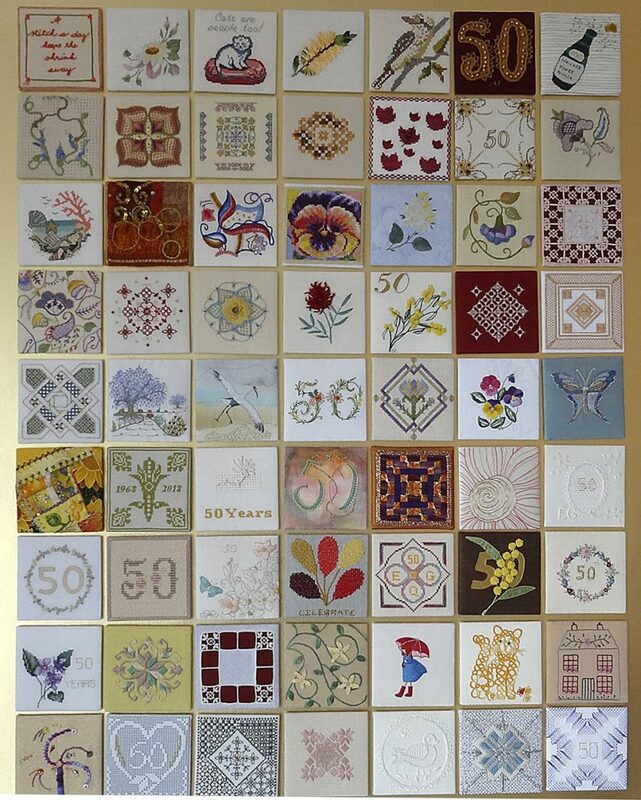 Our longest serving Guild member – Janet Patterson, who was celebrating her 50th Year of membership in 2018, agreed to unveil the panels. Members having complete freedom in their choice of fabric, stitches and design to create a piece of embroidery that reflects their concept of Celebrate! These tiles were collected and individually mounted and then framed. The final design of the piece is of three panels (each containing 63 squares). 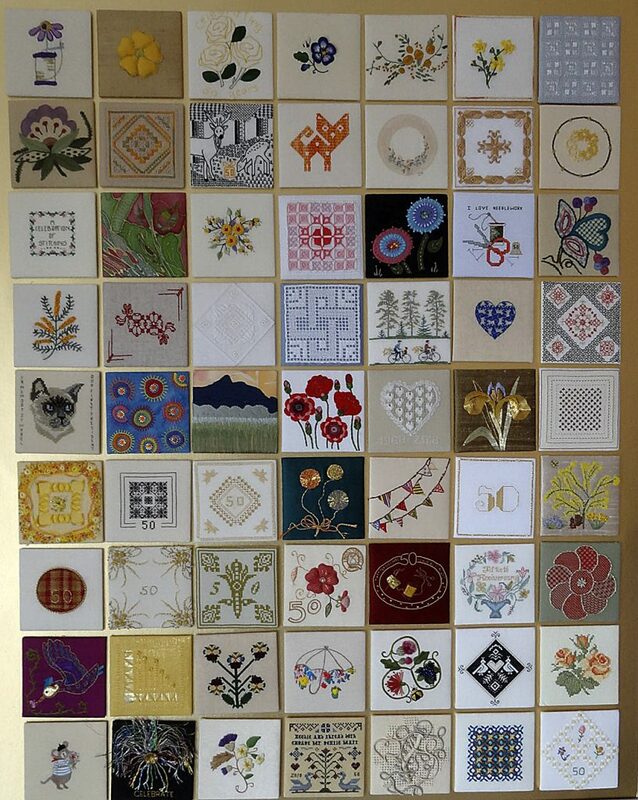 All 189 of the individual squares that comprise these panels are beautifully worked; and highlight a diversity of design, colour, technique and style. The resultant panels are a testimony to the artistry and skill of our members. The year of 2018 was filled with celebration for the Guild and demonstrated a successful union of honouring past traditions while also embracing an exciting future.